Alford Street Bridge, Boston, MA. Connecting Boston's Charlestown neighborhood to Everett. The new $56.1 million dollar bridge was constructed to replace an archaic span over the Mystic river. With little elevation change from the street level grade, this bridge is a lifeblood for hardworking commuters, not to mention, the ONLY street level crossing connecting Boston to Everett/Chelsea/E. Boston. 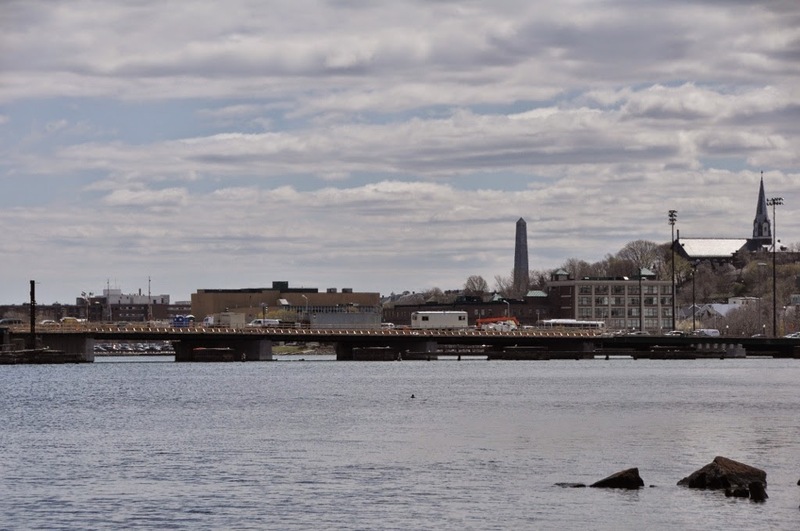 The $56.1 million dollar drawbridge to nowhere... With little else upstream besides 2 small yacht clubs and a state boat ramp, the Massachusetts Dept. of Transportation (DOT) decides to replace the bridge and repair/replace aging drawbridge. Why would you rebuild a drawbridge and constrain travel for FIVE years (Yelp), when there is a (low height) fixed train bridge right upstream? I thought. 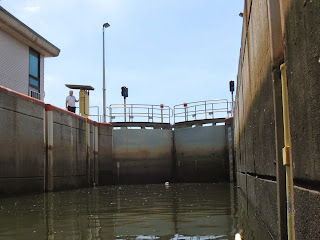 Just build a 12 foot MHT (mean high tide) bridge like are built all up and down the Eastern Seaboard, for boat traffic. Then I look at google maps and I reveal the Pandora's box. 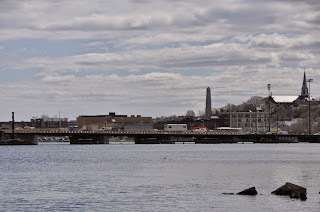 Not only is there a CSX train bridge just upstream of the Alford Street bridge, there is also a dam, the Amelia Earhart dam and another train bridge, operated by Mass Bay Transit Authority (MBTA). The Amelia Earhart Dam has THREE locks, the largest being 325 feet, long and 45 feet wide!?!? WTF, are they passing barges up the Mystic River? Exhibit B: Form, function and fiscally responsible. Penobscot Narrows Bridge carries traffic over the Penobscot River, Maine. In addition to being 1000% larger and more complex (than Exhibit A) it was finished in three years, from ground breaking to public traffic. 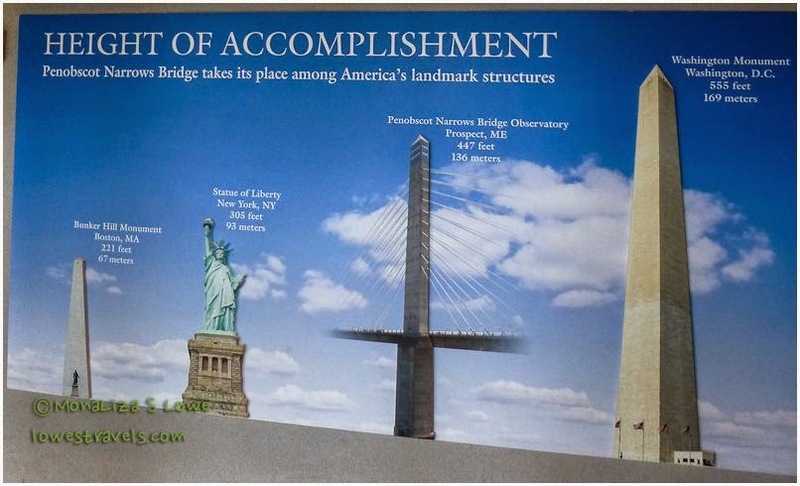 Build in haste, but not compromising quality, or the community, the new bridge was fitted with a three story 420'(ft) observation deck, fitted in one of the two obelisk shaped (think Washington Monument) towers. 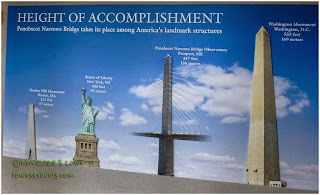 The Penobscot Narrows Bridge, the only bridge in the USA to have an observation tower, it's also the tallest (bridge) observation deck in the world. This is truly a marvel of engineering, design and expediency. Guess how much such a magnificent bridge cost? $100-$200 million? Nope, a mere $85 million, for one of Popular Science' 100 best innovations of the year 2006. Hey there! I am from Colombia and I love your blog!